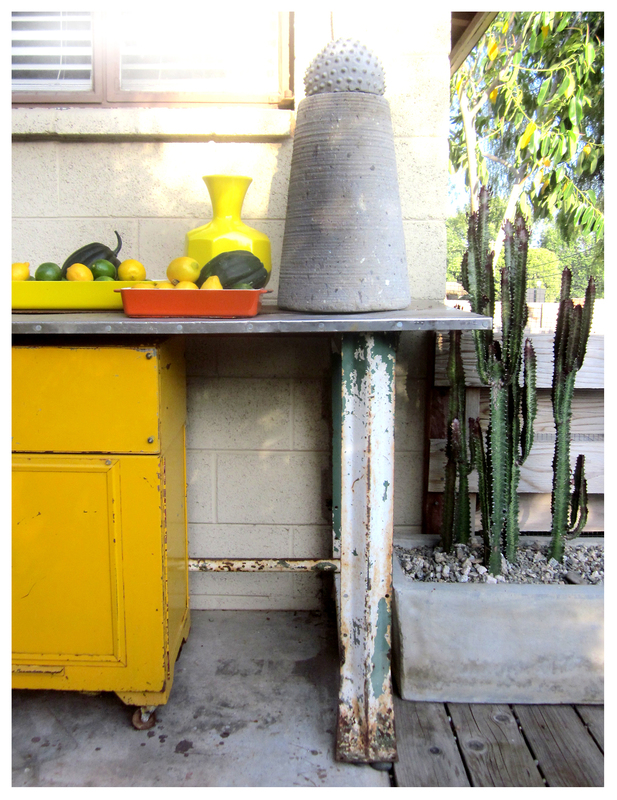 I’d bought this very old painted metal workbench from John Mihovetz in Pomona (his info here), attracted by its roughly distressed legs; it’s the perfect height and size for a buffet spread. To boost its functionality, I centered a yolk-yellow metal tool chest underneath for storage. Nice pop of color and it can hold (and hide) spare party ware. 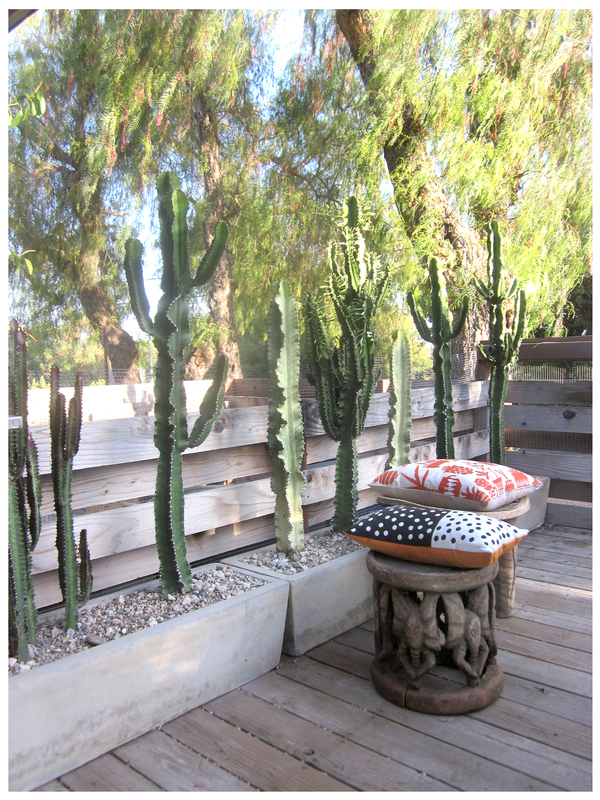 At the deck’s back end, a series of concrete planters held cactus that never quite lived up their potential as screening for our trash area … so, out they came. I replaced them with some too-big-for-their-planters euphorbias from elsewhere in the garden. A sculptural living screen that cost nothing and looks great … perfect! 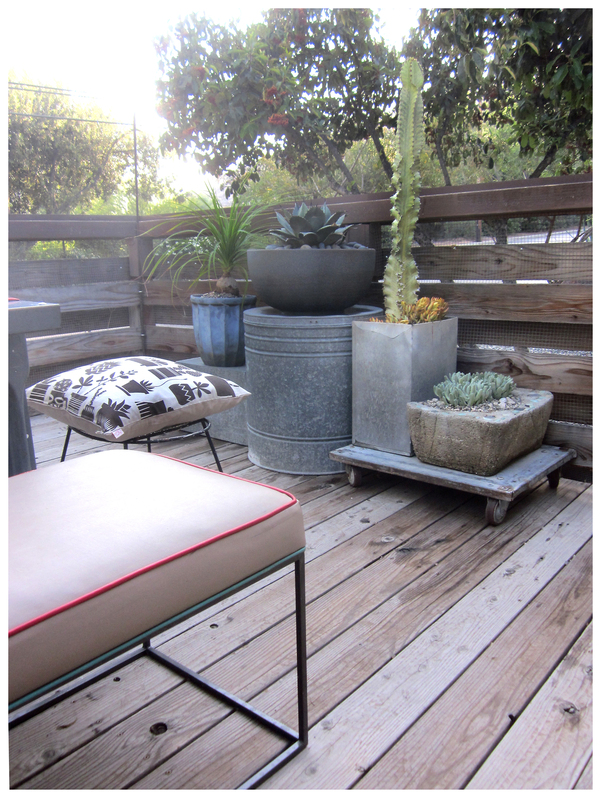 At the other end of the deck, diverse succulents in varied neutral gray containers demonstrate the importance of inviting an interesting mix of guests to the party … Details: The bench in the foreground began life as the chrome bottom-half of a ’60s-era credenza … we had a cushion made to top it and I painted the chrome a warmer gray-brown. The kicky succulent print cushion cover on the old metal stool came from Skinny LaMinx‘s Etsy shop (info here), all the way from Australia. 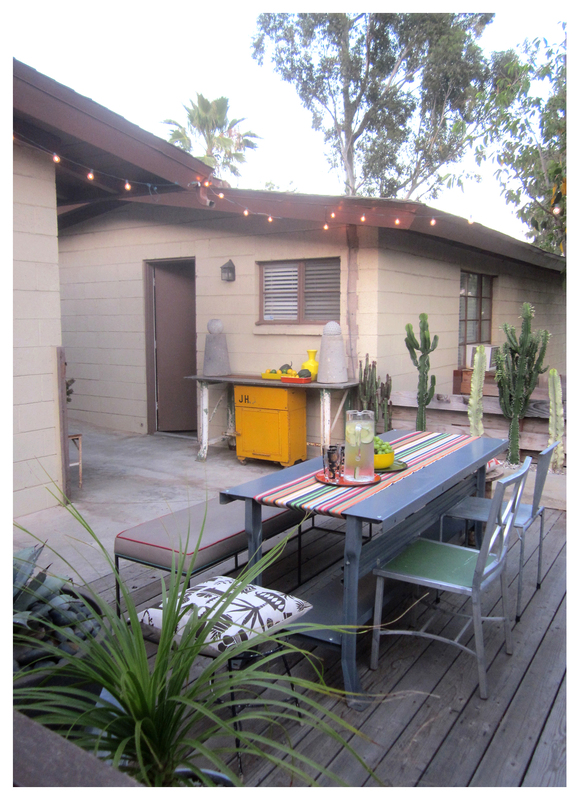 The new dining area is simple, neutral, functional and party-ready. It’s also multi-purpose: I can see myself using it for art projects, too … As a bonus, the industrial worktables are indestructible and can easily stand up to Riverside’s weather extremes. I love it when an idea works out … even more so when it works out as a result of being flexible and willing to shift gears! 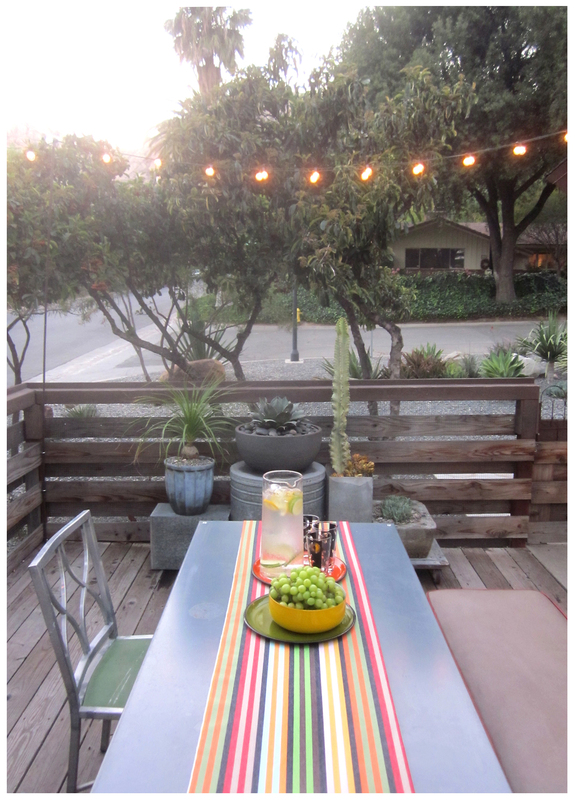 The table, deck railing and fencing is just right…especially with the focal point at the end of the table, of the mixed industrial / reused planters and sculpture plants inside. Cool! Thanks, David, I appreciate the comment! 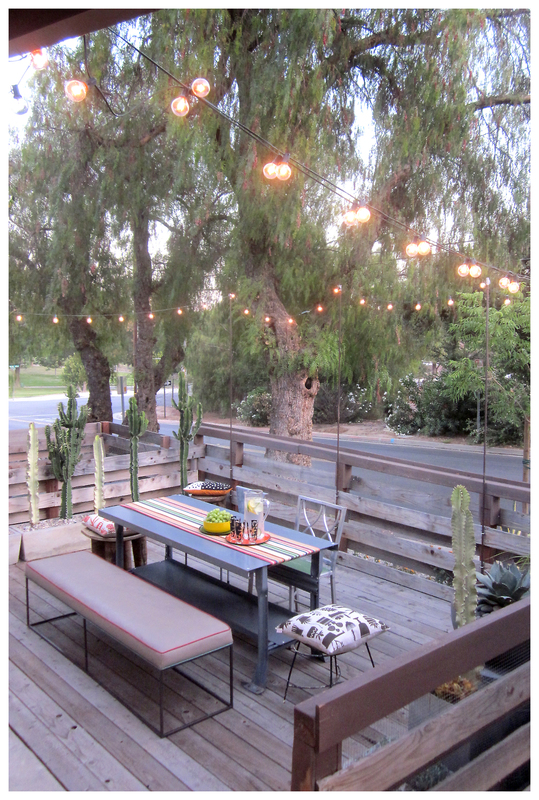 Love how this turned out ..and the string-o-lights sets it off splendidly..inspired! The lights set off cocktails nicely, thanks for commenting DD!